The Soga clan intermarried with the imperial family, and by 587 Soga no Umako, the Soga chieftain, was powerful enough to install his nephew as emperor and later to assassinate him and replace him with the Empress Suiko (r. 593–628). Suiko, the first of eight sovereign empresses, is sometimes considered a mere figurehead for Umako and Prince Regent Shōtoku Taishi (574–622). However she wielded power in her own right, and the role of Shōtoku Taishi is often exaggerated to the point of legend. Chinese culture had been introduced to Japan by the Three Kingdoms of Korea before the imperial Japanese embassies to China were established. Although the missions continued, the transformation of Japan through Chinese influences declined, despite the close connections that had existed during the early Kofun period. Meanwhile, the kingdoms of the Korean peninsula, often at odds with each other, frequently sent diplomatic missions with gifts to Japan, probably with the aim of securing Japanese neutrality or diplomatic/military support in their rivalries; ultimately, this proved to be of the greatest benefit to Baekje, as Japanese military support for that kingdom increased. People, many of them artisans and skilled workers, also emigrated to Japan from the Korean peninsula, including two high priests who arrived in Japan in 595: Eji from Goguryeo and Esō from Baekje. Kanroku also came from Baekje, and was a tutor to Prince Shōtoku, counseling him politically. When Japan allied with Baekje, the Goguryeo priests left Japan. The Yamato court, concentrated in the Asuka region, exercised power over clans in Kyushu and Honshu, bestowing titles, some hereditary, on clan chieftains. The Yamato name became synonymous with all of Japan as the Yamato rulers suppressed the clans and acquired agricultural lands. Based on Chinese models (including the adoption of the Chinese written language), they developed a central administration and an imperial court attended by subordinate clan chieftains but with no permanent capital. By the mid-seventh century, the agricultural lands had grown to a substantial public domain, subject to central policy. The basic administrative unit was the county, and society was organized into occupation groups. Most people were farmers; other were fishers, weavers, potters, artisans, armorers, and ritual specialists. 645: Soga no Iruka and his father Emishi are killed in the Isshi Incident. Emperor Kōtoku ascends to the throne and strengthens imperial power over the aristocratic clans (see Taika Reform), turning their states into provinces. 694: The imperial capital is moved to Fujiwara-kyō, in present day Kashihara city. 705: The Nishiyama Onsen Keiunkan is founded. It survives to become the oldest known hotel business still in operation, as of 2019. ^ a b c d e f g h i j k l L. Worden, Robert (1994). "Kofun and Asuka Periods, ca. A.D. 250-710". A Country Study: Japan. Federal Research Division, Library of Congress. Archived from the original on 6 April 2007. Retrieved 2007-04-06. ^ L. Worden, Robert (1994). "Kamakura and Muromachi Periods, 1185–1573, Economic and Cultural Developments". A Country Study: Japan. Federal Research Division, Library of Congress. Archived from the original on 6 April 2007. Retrieved 2007-04-06. Yoshimitsu, in 1404, accepted the "King of Japan" title in his willingness to improve relations with China and to rid Japan of the wako threat, thus establishing trade with China. This was considered as tribute by the Chinese but the Japanese saw it as profitable trade. This relationship lasted for about 50 years. (see also Sinocentrism). ^ general editors, John W. Hall... [; et al. (1988). The Cambridge history of Japan. Cambridge, UK: Cambridge University Press. pp. 182–183. ISBN 0-521-22352-0. ^ Web Japan, sponsored by the Ministry of Foreign Affairs, Japan. "One hundred years older than supposed? : World Heritage Pagoda". Retrieved 2007-04-04. ^ William Wayne Farris, Sacred Texts and Buried Treasures: Issues on the Historical Archaeology of Ancient Japan, University of Hawaii Press, 1998. Books.Google.com. ^ Sansom, George (1958). A History of Japan to 1334. Stanford, California: Stanford University Press. 47–49. 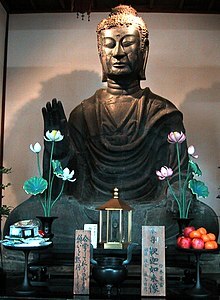 ^ Encyclopedia of World Biography on Shotoku Taishi "Two Korean high priests arrived in Japan in 595—Eji from the kingdom of Koryo (Koma) and Eso from the kingdom of Paekche (Kudara)." ^ Farris, William Wayne (1998). Sacred Texts and Buried Treasures: Issues on the Historical Archaeology of Ancient Japan. University of Hawaii Press. p. 95. ISBN 978-0-8248-2030-5. ^ "Complex of Koguryo Tombs". UNESCO World Heritage Centre. ^ "Tori style". Britannica Concise. Encyclopædia Britannica. ^ Kurashige, Taku; Rie Yamada (2003). "Asuka Period". Archived from the original on 2006-02-06.